The City of Osseo is seeking a Public Works Laborer for temporary part time work from end of May until beginning of September. Applicants must be 18 years of age or older, possess a high school diploma or the equivalent, or be a current student. Must have a valid driver’s license and clean driving record. Essential functions include mowing grass in City parks and rights-of-way, along with maintenance of mowing equipment and general landscaping. Direct questions to Public Works Director Nick Waldbillig at 763-425-5741. The City of Osseo is seeking a City Accountant with experience in municipal accounting areas including budget, Accounts Payable and Accounts Receivable, utility billing, payroll, and general ledger work. Experience with Banyon software is desired. Salary range $58,377 to $73,950. Click on this link to download a complete job description. Applications can be downloaded or picked up at Osseo City Hall. The position will be open until filled. First review of applications will begin after 5:00 pm on Monday, Feburary 25. Submit applications to Osseo City Administrator Riley Grams, 415 Central Ave., Osseo, MN 55369; Fax: (763) 425-1111. POLICE RESERVE OFFICER. The City of Osseo, Minnesota (pop. 2,500), is accepting applications for Volunteer Police Reserve Officers to assist with a variety of tasks such as traffic control, crowd control, assistance at accident scenes, fires, natural disasters, general patrol duties and assisting licensed Police Officers as needed. New Reserve Officers attend the Hennepin County Sheriff’s Office Reserve School and will complete a mandatory in-house, field training program so as to familiarize themselves with the equipment, geography and procedures of the Osseo Police Department. Other training includes defensive tactics, firearms, TASER, personal chemical spray and more. It should be noted that the Reserve Officers do not carry firearms. The Reserve Officer program is a great way for citizens to give back to their community, find out how law enforcement works and create leadership and teamwork skills for day-to-day life. To be eligible, a person must be 18 years of age or older, have a high school diploma or equivalent, a valid Minnesota driver’s license with a good driving record, and be able to pass a background investigation. Click on this link to download a complete job description. Applications can be picked up at the Osseo Police Department or by calling (763) 424-5444 or click on this link to download an application. Completed applications are to be submitted to the Osseo Police Department. Applications should be submitted via mail to the Osseo Police Department, Attention: Reserve Coordinator, 415 Central Ave., Osseo, MN 55369; Fax: (763) 424-4616; or E-Mail: tmortinson@ci.osseo.mn.us. The Osseo Fire Department is accepting applications. Visit https://www.discoverosseo.com/departments/fire/join-the-osseo-f-d/ for more information. 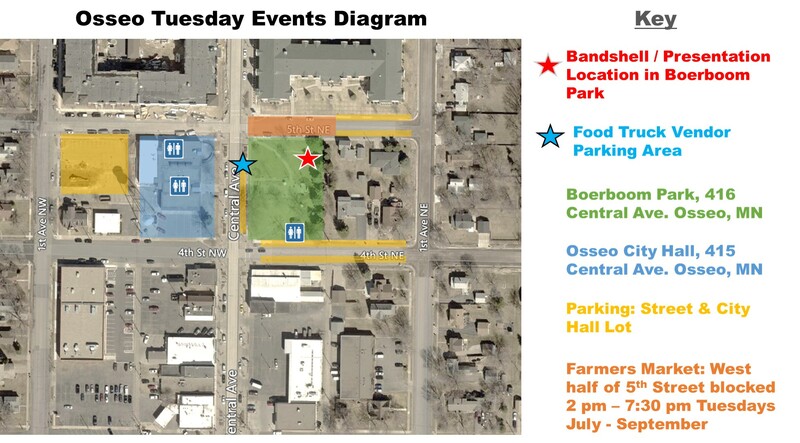 Food Truck Vendors are invited to apply to participate in scheduled Tuesday events in Osseo. Concerts and presentations are scheduled Tuesday nights in the summer. Approximately 50-250 adults and children attend each week. Food Truck vendors are invited to apply to attend the events to market their wares. Completed applications received by April 28, 2019, will be considered first. Applications received by April 28 will be notified of their status approximately May 10. Applications that arrive after May 1 will be given consideration, if space allows. Full refunds of the deposit will be given to any applications that are not accepted. Applicants are sought to serve as a limited number of “Approved Caterers” for the Osseo Community Center (“OCC”). Approved Caterers are eligible to provide alcoholic beverage service at the OCC. Approved Caterers will make arrangements directly with OCC Users who desire to have alcohol served at the OCC. The City will provide OCC users with contact information for all Approved Caterers.